2. The adoption of 12 monthly average of the retail prices is contrary to Dr. Aykroyd formula. Same is the case with the reduction effected by the Commission on housing and social obligation factors. The house rent allowance is not a full compensation of the expenditure incurred by an employee for obtaining an accommodation. Therefore, no reduction on that count in arriving at the minimum wage is permissible. We may cite the minimum wage computation made by the 3rd CPC in this regard. The employees were in receipt of HRA even at that time. But still the 3rd CPC, and rightly so, adopted the 7.5% as the factor for housing. In respect of the addition to be made for children education and social obligation as per the Supreme Court judgement, (25%) the Commission has reduced the percentage to 15% on the specious plea that the employees are separately given children education allowance. The Children education allowance is not a full reimbursement of the expenses one has to incur. After the liberalization of the Education Sector where private parties were allowed to set up universities and colleges, the expenses for education had increased heavily. No concession or allowance is granted to the employees for educating the children beyond the higher secondary levels. The earlier Pay Commission has only tried to compensate a little in the increasing cost of education and that too at the primary level, since even the Governmental institutions had started charging abnormal tuition and other fees. 4. The Andhra Pradesh State Pay Commission in its report has taken the commodity prices at Rs. 9830,- as on 1.7.2013 which works out to a minimum wage of Rs. 18080. The wage of MTS will then be Rs. 22600 as on 1.7.2013. The Corresponding figure for 1.1.2016 shall be Rs. 26758, rounded off to Rs. 27000. 7. In para 4.2.9 of the report, the Commission has given a table depicting the percentage increase provided by the successive Pay Commissions, according to which the 2nd CPC had made a paltry increase of 14.2%. The 3rd CPC gave a rise of 20.6, 4th 27.6, 5th 31.0 and 6th CPC 54%. 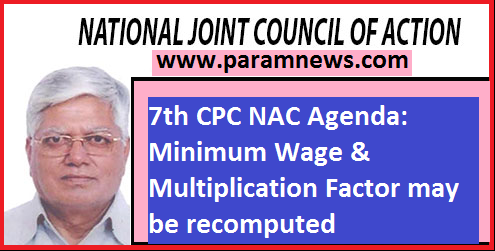 While the per centage increase had been in ascending order all along, the 7th CPC has sought to reverse that trend ostensibly for reasons unknown. It was the meager increase of 14% provided for by the 2nd CPC that triggered the volatile situation in the civil service and led to all India strike encompassing all employees which lasted for 5 days in 1960. 9. After the implementation of the Pay Commission Report the AP State Employees have been given a wage structure based on a minimum wage for above the level of Central Government employees. In their case also wage revision does take place once in 5 years. The Staff side had computed the minimum wage as on 1.1.2014 at Rs. 26,000, taking the commodity price at Rs. 11344. The rates were taken on the basis of the actual retail prices in the market as on 1.1.2014, As on 1.12016, the minimum wage work out to Rs. 29339, rounded off to Rs. 30,000.